Norway’s intelligence-gathering activity is higher than it’s ever been since the end of the Cold War, with its number of assignments increasing five-fold in the past seven years. Norway’s wide range of international operations is behind the increase. Newspaper Aftenposten reported on Tuesday that Norway’s state intelligence service Etterretningstjenesten has received a 35 percent budget hike since 2005, from NOK 690 million to NOK 930 million. Staffing has risen to more than 800 employees, and the new head of the intelligence service confirms heightened activity. With less than 5 million inhabitants, Norway is a small country on the world stage, but its international presence defies its size. As one official of a foreign embassy in Oslo remarked recently, “Norway is everywhere,” while other countries have boosted their spying activities as well, The head of the police intelligence agency PST recently said her staff was “on guard” and aware of heightened interest in Norway’s own activities. Norway’s military presence in Afghanistan, Chad, Somalia, Sudan, Kosovo, Egypt, Bosnia, Congo and the Middle East has led to the need for the higher level of intelligence, not least because of Norway’s contribution of special forces in troubled areas, reports Aftenposten. One of the five Norwegian soldiers killed in Afghanistan was, for example, a captain assigned to the so-called E-tjeneste. The most important area for the intelligence-gathering efforts, though, remains the far north where Norway shares a border with Russia. Norway’s high-tech intelligence gathering directed at Russia has for decades been the country’s perhaps most important contribution as a member of NATO. Anti-terror activities are also a high priority. As head of E-tjeneste, located within a fenced-in complex on the edge of Oslo’s eastern forest known as Østmarka, Grandhagen is responsible for all civilian and military intelligence gathering outside of Norway. The intelligence service’s organization has sparked criticism from a researcher at the foreign policy research institute NUPI in Oslo. 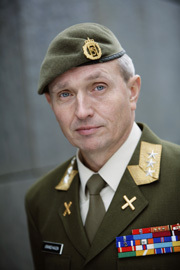 Vegard Hansen, who has worked at E-tjeneste himself, told Aftenposten that he thinks its heavy military leadership (led by a general, who is answerable to the Defense Minister) is “an anachronism” and should be reorganized. “I think there’s a need for intelligence- and security reforms in Norway,” said Hansen, calling for more “shared responsibility” regarding the constitutional, political and professional aspects of intelligence gathering.